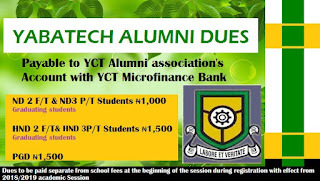 Yaba College of Technology (YABATECH) ALUMNI Dues for all Full-Time and Part-Time Graduating National Diploma, ND, Higher National Diploma, HND and Postgraduate, PGD Students as from 2018/2019 Academic Session. Authorities of the Yaba College of Technology (YABATECH) has released the ALUMNI Dues for all Full-Time and Part-Time Graduating National Diploma, ND, Higher National Diploma, HND and Postgraduate, PGD Students as from 2018/2019 Academic Session. 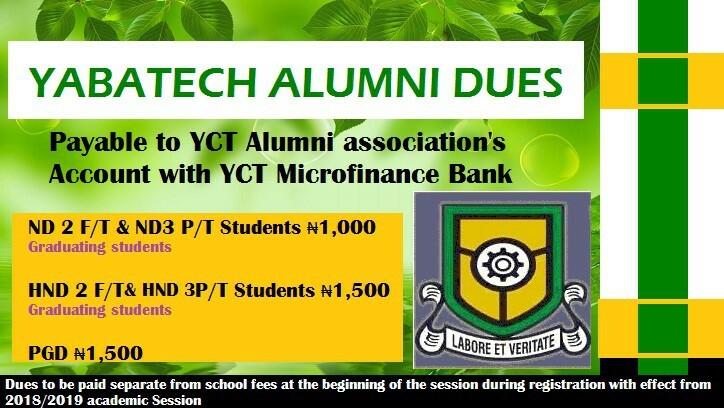 All Dues are Payable to YCT Alumni Association's Account with YCT Microfinance Bank. Dues are to be paid separate from school fees at the beginning of the session during registration 'with effect from 2018/2019 academic Session.